CHICAGO -- You never know who you'll bump into here at this largest biotech conference, now in its 20th year. It's a bit like strolling the United Nations. If you walk down one aisle and think you're whiffing Turkish food, you are. (I'm told it was very good.) Depending on how fast you walk, you can hear a different language every 30 seconds. And the individuals may be at any level in their respective country or state. Governors have shown up here, as well as ambassadors, consuls and, more commonly, national trade ministers, not to mention Nobel laureates. And then some of us are the folks who just say hi and shake hands. I have met people from Ireland, Brazil, Japan, Sweden, Denmark, Belgium, and Hong Kong. And that was just this afternoon. I hate to single out one, but by rank I can. Tatsuhiro Shindo is CED - Chief Executive Director of the Japan Trade Organization. Shindo-san is based in Chicago and attended the Minnesota reception and then showed up at the pavilion to continue the conversation. 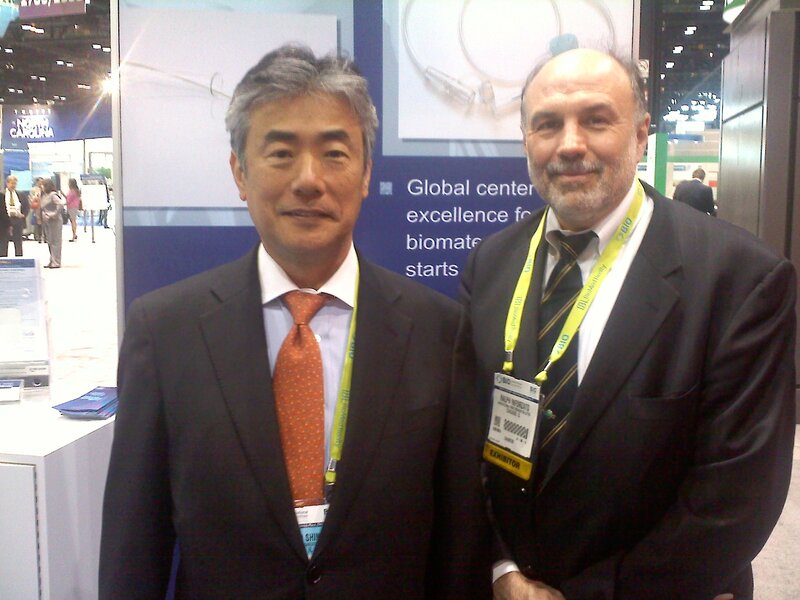 Along with Ralph Inforzato, Director of Business Development, Shindo-san was making as many contacts as possible. We had a nice chat about genomics and regenerative medicine. He spoke well of Minnesota, which we are always happy to hear. He now has a standing invitation to visit Minnesota...and a personal tour coming from a certain blogger from Mayo Clinic.